If you’re looking to develop a new application or a website, you may not have given much thought to making it look and feel trustworthy to your potential users. But trust me (pun intended) it’s important. A well-trusted, well-reviewed website or app will draw new, repeat users and boost your online presence, business, and reputation. So how can developers and designers create and design trust? This article focuses on elements and techniques which will enable you and your website or app to gain the trust of your users. What do you mean with “trust”? Trust (noun) Firm belief in the reliability, truth, or ability of someone or something. ‘relations have to be built on trust’. Fundamentally this can be applied directly to software. Your software should be reliable, truthful, and have the ability to do what it was created for. We’ve all got frustrated with a badly designed app or an illogical website so don’t allow yours to fall into any traps. 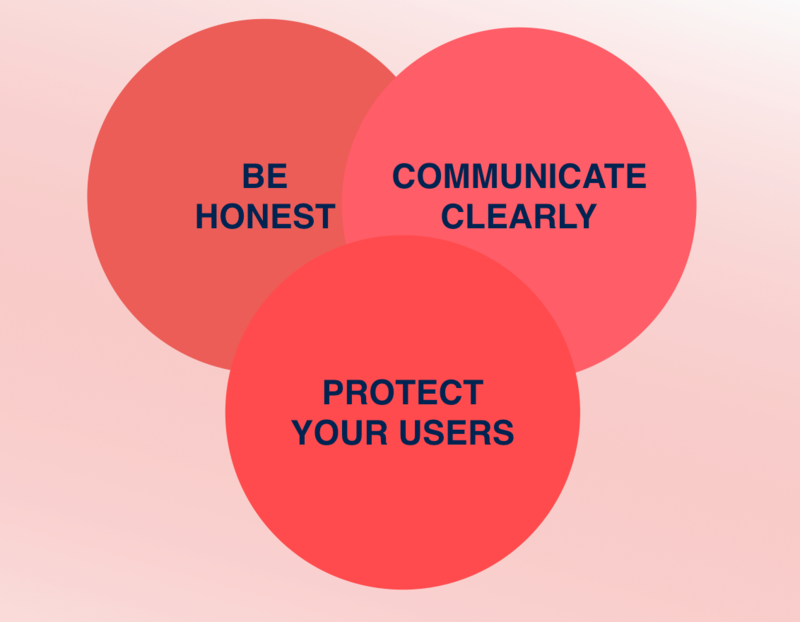 Making false claims, over-exaggerating your abilities or scope, or initially hiding costs or terms and conditions loses user trust and usually their future business. If your website or app claims to offer a service, ensure the software for that service is working perfectly. If your satellite navigation application gets someone lost on their first use or your online photo storage website crashes and wipes all the data, your users’ trust levels are going to be rather low and repeat usage unlikely. Be honest – don’t claim to do or be something that you’re not. Lying is the easiest way to lose users’ trust. Communicate clearly – be pragmatic and precise. Talk like your customers talk. Protect its users – make sure any personal information (credit card numbers, email addresses, sensitive information) is protected, firstly, and then reassure your users themselves that their security won’t be compromised. How do you communicate trust? The key word here is communicate. Communicating itself can inspire trust between a user and a product. Make sure your website or app responds to your user in a number of different ways. Hiring a UX (user experience) designer can help you to build a certain degree of flexibility into your product so that the user feels like they are part of the overall experience. For example, if your app is taking time to respond because of poor mobile reception, create a pop-up message apologizing to the user and assuring them the app is working as quickly as possible to do the requested task. Or if a user is creating a birthday card online to be printed, warn them when the photo or text is outside of the printer’s capabilities rather than allowing them to order a sub-standard product. If you have both an app and a website, make sure their software is compatible and communication between the two is efficient and comprehensive. Terms and conditions are a great way to communicate trust. They allow you to lay out, quite literally, what you expect from your customers and what then can expect from you in return. This also includes data protection polices, which will be discussed below. Don’t forget to make the terms and conditions easy to find a download. Hiding them away makes it look like you have something to hide too. Reviews of apps can affect drastically its success in the market. Of course, you’re hoping they’ll all be positive but if you receive a negative review which contains constructive criticism of your software, get your UX on it as quickly as possible to rectify the mistake. This may be a fiddly, time-consuming project but ignoring a problem, especially one identified by a user, damages trust and will lose you customers. Once the problem has been solved and your next update is launched, highlight the ‘bug fixes’ to illustrate to your users that you are dedicated to providing the best possible service. How can you test how trustworthy your product is? Bug tracking and software assessment products can be used to test the trustworthiness of your app or website. By allowing one of these products to analyze your content before you go live, you will have a chance to iron out any kinks and glitches before releasing your platform to the general public. Predictably, anything wrong with your website or app in particular will be highlighted in a review sooner or later. It’s better to deal with them in private to ensure you are considered high-quality from the start. Don’t launch with a sub-par product. You want the first impression of your website or app to be the best possible, so listening and responding to the feedback from bug trackers and software assessment products is highly advised. It may also be worth investing in User Acceptance Testing (UAT) which quite literally tests how acceptable your product is for users. By offering users a chance to test-drive your website or app, you’ll be able to get feedback from real users in regards to the software’s usability. What more could you ask for in terms of testing product’s trustworthiness? Their response can help you identify areas which could be improved and any problems within the product itself which you and your team may not have recognized after months, if not years, or working on the same software. A fresh pair of eyes is always helpful. Are there elements of trust in the design? Good design is absolutely key when it comes to trust. A coherent style and accessible, user-friendly look helps visitors immediately feel at home and comfortable navigating the platform. Anything complicated, unclear, or misleading will be off-putting to users from the moment they arrive and a return visit will be far less likely. Also important is the design of a system which protects sensitive information. Data breaches are rampant these days and you’ll need to do everything you can to both safeguard your users and reassure them that they can trust you with their details. Who hasn’t turned away at the last moment from an online check-out because something just didn’t feel quite right? Make sure your terms and conditions are accessible, comprehensive, and explain exactly what your company intends to cover users against. If you’re developing an app, ensure users have to confirm they want automatic updates. If you’re launching a website, make sure your visitors aren’t forced to download anything unless they expressly select to do so. They need to be easy and convenient to use (e.g. have a ‘keep me logged in’ feature, or remember items previously put in your basket from an earlier shopping session), aesthetically pleasing (take your time getting that perfect look for you and your company), and stable (no one likes a website which crashes every few minutes). Confirm that the web address begins with HTTPS. Look for a lock in the address bar (this indicates it’s harder for hackers to view your movements). Check the seal of approval (this validates your authenticity). Apps on the other hand, still have a long way to go in terms of development. There is still a general lack of communication between the user and the software itself once the app has completed its installation. Perhaps yours will be the one to break that mold. Interact with your user, let them know you’re there, helping them as best you can as they navigate your app. Additionally, the easiest way to appear instantly trustworthy is to have your app available through reputable distributors: namely Apple’s App Store and Android’s Google Play Store. Positive reviews within these stores will also increase downloads, inspire user confidence, and built trust. Trust needs to be both created and designed for new and existing software. With trust comes a great reputation, repeat clients, and an expanding customer base. We hope this article identified the importance of trust for software and how to achieve it.